Video chatting on mobile devices is something we are now doing more and more everyday from iPhone, iPad or iPod Touch devices. Either communicating with co-worker or getting in touch with friends and family, video chat becomes the best way to do it from our iPhone or iPad with fast Internet connection. There are plenty of free iOS video calling apps available but we are looking for some of the best apps for face-to-face video calls. The native FaceTime Video feature offers everything you would expect for video calling but it works only between iOS Devices. What if you need to communicate between multiple platforms such as Android, windows and PC? Let’s checkout the Best Video Calling apps for iPhone & iPad we have chosen as the winners in that area. Skype app is a great application for iPhone and iPod touch that lets you make free voice and video calls over the Internet. Skype app has the same basic functions as on the PC or Mac. The program allows text chat and Internet phone calls, and since the most recent update also makes video calls via WLAN and UMTS. The entire user interface has been perfectly fit in the circumstances of the Apple mobile operating system and the voice quality is quite useful. Skype app is easy to handle due to its usual simple menu system. The app also allow for VoIP calls over the mobile network (3G). Skype also supports multitasking as calls, and messages can be received even when the app is running in the background. Calls, you can also resume when you switch from Skype to another app. Skype users can also continue to use their Bluetooth headset to make calls. This app is compatible with iPhone, iPod touch, and iPad and requires iOS 5.0 or later. 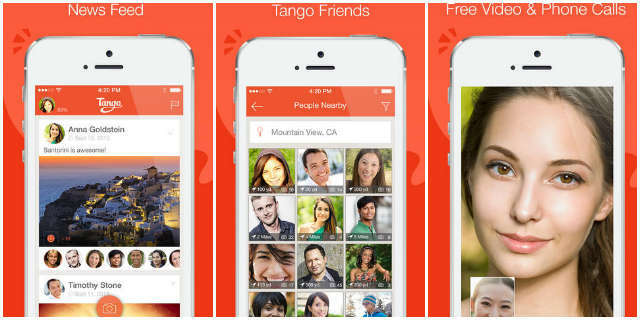 With the free iPhone app ‘Tango’ you can make voice or video calls over 3G, 4G or Wi-Fi to other users of the network. And you do not even need an account to get the service of this free app. You only need to enter your mobile number and your name so that other users can see and add. The app allows video calls, if your device has a camera. You can also create group chats as the new updated version 2.8.4 allow you to do that. This application requires iOS 5.0 or later. 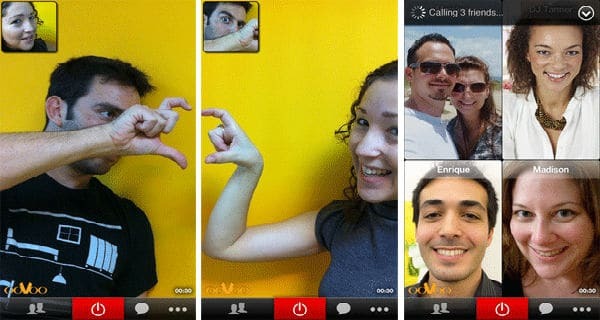 FriendCaller Video Chat is a free cross-platform, multi-party video calling app for iPhone that allows you to speak with up to 7 friends at once, and supports connections with 3G and 4G network connections. You can send pictures, videos, animations, and location information for your voice and video to your friends. Furthermore, FriendCaller is supported on iPhone, and other iOS, Android devices and PCs Their features include the ability to make voice calls and text messages. Stay in touch with your friends on their smartphone device or PCs and make use of free video calls with this instant messenger application, Yahoo messenger. With its well-functioning intelligence option, you can send your messages as an SMS to your Yahoo contacts easily. The “Yahoo Messenger” copes not only with contacts in the Yahoo network, but also speaks to MSN (Windows Live) contacts. Cool is the built-in video chat feature: Similar to Apple’s “FaceTime” You have access to the front camera of the Apple devices for video conferencing. The tool can be operated both in the WLAN, as well as traveling in the 3G network. Your contacts don’t even need a smartphone, it can be registered with their account on the PC. ooVoo allows video and voice calls from phone to phone or from phone to PC. To do this you have to create a free account. Then let the free app on your search request address as well as your Facebook friends to find contacts who are using ooVoo. Alternatively, you can also manually search for other users by email address or username. Fring is a mobile chat unit. This is might be a good app for those who just want to have a multi-messenger. Sounds good, you can speak with up to three friends at a time, but the quality will then lower. 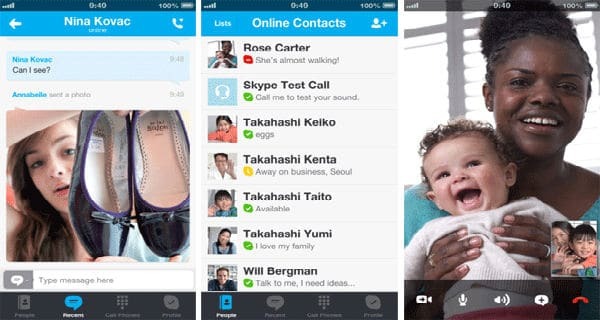 So you can connect to a single application with chat networks of Windows Live (MSN), ICQ, AIM, Google Talk, Twitter, Facebook and SIP, send text messages or free (video) make calls to other fring users. This is another option to make video call with other iCall users! With its multitasking options you can send instant message, share photos, and chat with friends on Facebook chat, AIM, ICQ, Windows Live Messenger and Google Talk. Download these Best Video Calling apps for iPhone, iPad & iPod for Free and let us know which you’d like most to use as your regular video chatting apps. Enjoy!